Don't wait until wash day -- keep your clothes and linens sorted in our exclusive Elfa Laundry Sorter. Available only at The Container Store, the unit includes two 2-Runner Mesh Drawers, one 3-Runner Mesh Drawer, a Melamine Top, and Back Stop Pins. The fine weave of the mesh prevents small items from falling through. Choose from two widths, Wide (shown) or Medium. We offer a variety of Drawer Accessories that you can add to customize your solution. Elfa is an entirely customizable system - if this isn't exactly the solution you're looking for, try our Elfa Drawer Planner. White Elfa Mesh Laundry Sorter is rated 4.9 out of 5 by 23. Rated 5 out of 5 by nani1515 from high quality I use this sorter for my closet. It fits perfectly underneath my hanging clothes. I store my bulky winter sweaters, cardigans, and work pants in these drawers. I want to purchase another one for my jeans, shorts, and casual tops. It's very sturdy and I love the clean look of it. The only drawback is that I had a little bit of a hard time putting the metals bars together. Rated 5 out of 5 by jmvDCK from Perfect fit, looks good This was the exact size I needed and has helped me keep my laundry room much more organized. You could use it for so many other things as well. 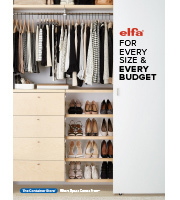 I can't wait to start replacing my cubes in my closet with the elfa drawers. Rated 5 out of 5 by Kassy from Wonderful Purchase This was very easy to put together and rolls in and out of the closet to the laundry area with ease. The drawers slide in and out easily and quietly. Rated 5 out of 5 by Suni from Well made Very sturdy, shelves move smoothly, Elfa products are worth the cost! Rated 5 out of 5 by SandDollar from Love this! This is my second sorter. They double as bedside tables. I was able to put them together by myself. Rated 5 out of 5 by LJMAZ from These mesh drawers are wonderful! I use them to store clothes in my closet and they fit perfectly under my hanging clothes to essentially double my closet space. They're easy to put together and the drawers are very light weight. I love that they are mesh so it's easy to see what's inside. I highly recommend getting the elfa Mesh Drawer In & Out Stops so the drawers don't come out when you open them. Very happy with my purchase - I bought 3!! Rated 5 out of 5 by ALC65 from Great as always:) This is my third elfa purchase. The parts are sturdy and made well and the assembly is so easy. Provides lots of storage. I am using it in the coat closet for hats, gloves and scarves. Rated 5 out of 5 by Robinyo from Love Elfa Products I am using this as a nightstand for my bedroom instead of a laundry sorter. I love the ease of putting the products together and also the fact that it is not bulky. It is easy to move and you can put the drawers in any fashion you like. Rated 5 out of 5 by BabsArts from Great For Storage This laundry sorter took the place of all the plastic bins I had my out of season clothes stored in. The bins were too heavy to lift and difficult to move around. The Elfa Laundry Sorter holds just as much and is so easty to scoot in and out of the closet, I got 3 of them and they look great! Rated 5 out of 5 by ithink from Elfa is always a smart choice I've been a Container Store customer for many years and a real fan of the Elfa products. Now that I have moved from a 3-bedroom home to a 2-bedroom apartment the many configurations of the closet systems help me maintain order and stay organized. The many sizes of drawer units eliminate the need for large, expensive and space wasting dressers and chests. A drawer unit in the closet holds all those "foldables" without gobbling up precious floor/living space. In my smaller living arrangement I no longer have a room that can be dedicated as a "home office" so the file cart on wheels is perfect. Stash it out of sight in a closet until it's needed then hide it away again. It comes with 2 drawers to hold supplies and the ever-present "filing to be done" stack. The addition of freestanding shelf units permit apartment dwellers to utilize all the wonderful shelving ideas and options for storage and work spaces without the lease violations of hanging the shelf standards AND when you're ready to move from your current location simply pack it all up and take it with you! Life is good. The service at TCS is without parallel. Rated 5 out of 5 by KathyJ from Useful, Durable, Can Open a Drawer w/ One Finger I purchased this item to use next to my washer/dryer to hold items before a full load was reached. I love the fact that I can open the drawers with only one finger! It was a little intimidating when opening the box, but we put it together in less than 30 minutes with minimum tools! Love it! Rated 5 out of 5 by Mecross from Great Hamper What a great way to manage the laundry! A drawer for darks, mediums and whites... Takes the hassle out of laundry day sorting! The top makes a good folding surface. Great product.. Rated 4 out of 5 by dena from favorite craft storage I had the Elfa baskets on casters for many years, using it to sort large and small craft items, especially for scrapbooking. Had the unit rolled into a closet. Because I moved to smaller space, my 9 year old granddaughter asked for it for her closet. She stores her little tops and pants, shoes and other "precious" items. This unit has served two generatons very well. Rated 5 out of 5 by DigsGardens from 1,2,3, It's Ready My husband spotted this and The Container Store along with Elfa designed the perfect fit for most spaces. It saves room in our closet and when a drawer is full it is easy to remove and carry it to the laundry room. The drawers are easy to carry and fit through doorways without crunching your fingers. Love the Elfa. We did our whole closet in Elfa and are now working on our garage. The workshop is next! Rated 5 out of 5 by Txdidi from Elfa Laundry Sorter When the Elfa rep suggested this laundry hamper system I was skeptical but after her showing us how it works, I agreed to try it. I have to say that this is the best thing since champagne and chocolate!!!!! We have it in our master closet. The drawers slide like silk. We have three large baskets and one small for hand washables. Whites, coloreds, towels, hand washables. Holds a week's worth of laundry for two adults. I pull one basket out at a time and carry to the laundry room. The basket is then used to put clean clothes in as taking them out of the dryer. I fold the clothes then carry back to our closet in the basket. I am thrilled with this product and system! It is worth every penny spent and I can see it lasting for years. This system is totally comparable in price when comparing to other laundry basket systems. Rated 5 out of 5 by Tigerlii from Great Hamper/Sorter This saves me so much time when doing laundry. It was also easy to assemble and the drawer sizes and height could be customized to my needs. It's just a matter of the sizes(height and depth) and the amount(3 vs 5) and size of drawers(depth and how many of each). Can you add wheels to make it moble? You can add casters to this unit. See link below. It looks as if in the picture there is nothing on the bottom, just the prongs that need to go into something. How tall is the unit with 1) wheels 2) something to cover the prongs to protect a wood floor? Our elfa Casters add 3&quot; to the height of any elfa Drawer Frame; our Frame Feet add 1/8&quot; to the height of any elfa Drawer Frame. I was hoping to put this under a countertop that is 29 3/8&quot; high. Is there a way to not attach the top piece to the unit (making it slightly shorter)? Is 18&quot; the depth and 21&quot; the width? Or is it 18&quot; wide and 21&quot; deep? Thanks! The product is listed W x D. It is 18'' W x 21'' D.
Hi! Can I use this to store shoes? Yes, these drawers can be used to hold shoes. Is it possible to purchase the parts separately? I might want to put the wider wooden top on it if possible. Yes, all elfa Drawer Components are available open stock. Is it possible to hang folders in one of these? Add our elfa Drawer File Channels to a 3-Runner Drawer (Medium for letter-size files or Wide for legal-size files) to instantly create hanging file space inside a drawer.